Touriga nacional is one of the five best grape varietals for making port, and is often considered to be the quintessential port grape. The vines make relatively small clusters of small berries, and tend toward low yields. The wines made from touriga nacional are dark, fruity, and aromatic, with a distinct nose probably closest to mulberry or boysenberry, and have a good balance of fruit, acidity, and tannin. Touriga nacional can make a delightful dry wine, particularly when blended with small amounts of other grapes, but is best known as a key constituent of fine port-style wines. 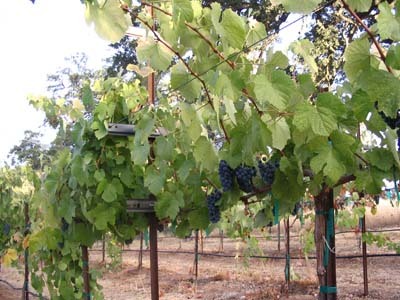 At Shaker Ridge, touriga nacional (clones “touriga nacional”, 01, and 03) is grafted on St. George rootstock and trained on a vertical cordon or trellised with a horizontal cordon and modified vertical shoot positioning. The fruit typically ripens in late September to mid-October.